The active phase of the Madden-Julian Oscillation (MJO) is enhancing El Nino convection in the equatorial Pacific, increasing the probability of above average rainfall in California over the next two weeks. Here are today's 6-10 day outlook and 8-14 day outlook periods from the Climate Prediction Center (CPC). Once again, a number of the CPC's best fitting 6-10 day outlook analogs and 8-14 day outlook analogs are from wet El Nino years. Today's Global Wind Oscillation (GWO) phase plot reflects the atmosphere's response to the MJO, and enhanced central equatorial Pacific convection. ECMWF-based 250 hPa streamfunction anomalies from 01/29/10 00:00 GMT appear to be consistent with the ERSL/PSD phase 7 MJO streamfunction composite and phase 6-7 GWO streamfunction composite centered on January 27. Another strong Westerly Wind Burst (WWB) is also occurring, and appears to be one of the mechanisms associated with MJO enhancement of deep El Nino convection. This enhancement and resulting feedback could slow the decline of, or even increase, equatorial Pacific SST anomalies in the weeks ahead. Both the ECMWF and the GFS are projecting a return to a wet pattern in California next week. The first skirmish occurs in central and northern California over the weekend, and then a transition to a much wetter, and possibly persistent, pattern is forecast to occur during the week. We'll see! It's a Wrap on Six Consecutive Days of Los Angeles Rain. Following six consecutive days with rain, skies are partly cloudy today and Southern Californians can finally get out and enjoy a little sunshine. According to NWS data, Downtown Los Angeles (USC) received 4.58 inches of rain from the series of storms, bringing its water year total to 9.71 inches, which is 3.57 inches above normal for the date. The Los Angeles/Oxnard office of the NWS has released a Public Information Statement with rain and snowfall totals for the 6 day period 10:00 a.m. Sunday morning to 10:00 a.m. today (Saturday). Computer projections have been inconsistent, but it looks like we'll probably get some more rain early in the week. We'll see! 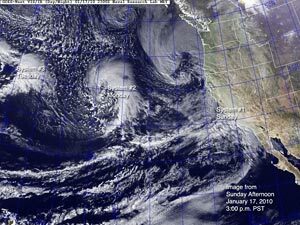 The fifth and final system of the series that began Sunday brought thunderstorms, damaging winds, record low pressure, heavy rain and snow to Southern California yesterday. 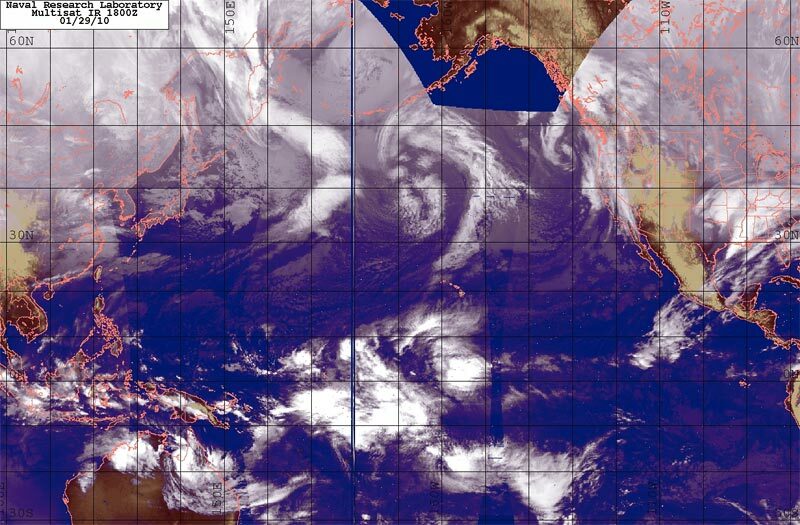 The unusually large trough associated with the system covered most of the northeastern Pacific yesterday, and unsettled weather is expected today as it continues to move onshore. Very strong wings, possibly a tornado or thunderstorm downburst, felled trees and damaged structures in Ventura and Santa Barbara. Record rainfall for the date was recorded at Santa Maria, Palmdale, and Lancaster, but more extraordinary, new all-time records for lowest barometric pressure were set at several locations in the Los Angeles area. Note: The NWS documented an EF-0 tornado in Ventura (3Mb PDF). As of yesterday, Downtown Los Angeles (USC) has received 4.21 inches of rain from the series of storms, bringing its water year total to 9.34 inches, which is 3.44 inches above normal. Over the week, the Sierra Nevada has received several feet of snow, and the statewide average snowpack is now above normal. Please refer to www.weather.gov/losangeles for the latest warnings and weather information. One-Two Punch the Finale for an Extraordinary Series of Storms. In a classic case of "be careful what you wish for," Southern California has been awash in a series of storms that rival those of the biggest El Nino years. Coming on top of the rain we've already recorded this week, today's and Thursday's systems appear likely to deliver a combination punch with potentially serious consequences. Yesterday's vigorous system was characterized by scattered thunderstorms, heavy downpours, and damaging winds. Rainfall amounts generally ranged from about 0.5 inch to 1.0 inch, with some isolated higher amounts. Here's an archived copy of NWS Public Information Statement with preliminary rainfall totals for the period 5:00 a.m. to 4:00 p.m. Tuesday. Today's frontal system, the fourth in the series since Sunday, is producing heavy rain, strong winds, and the possibility of thunderstorms. More rain is expected than resulted from yesterday's storm. BUFKIT analysis of 18z NAM data for Van Nuys (VNY) indicates about 2 inches of rain today and tonight, with generalized rain rates peaking at about 0.4 inch/hour. Higher localized rainfall rates could occur in the vicinity of thunderstorms. Here is an archived copy of a NWS Los Angeles Quantitative Precipitation Statement with more detailed information. 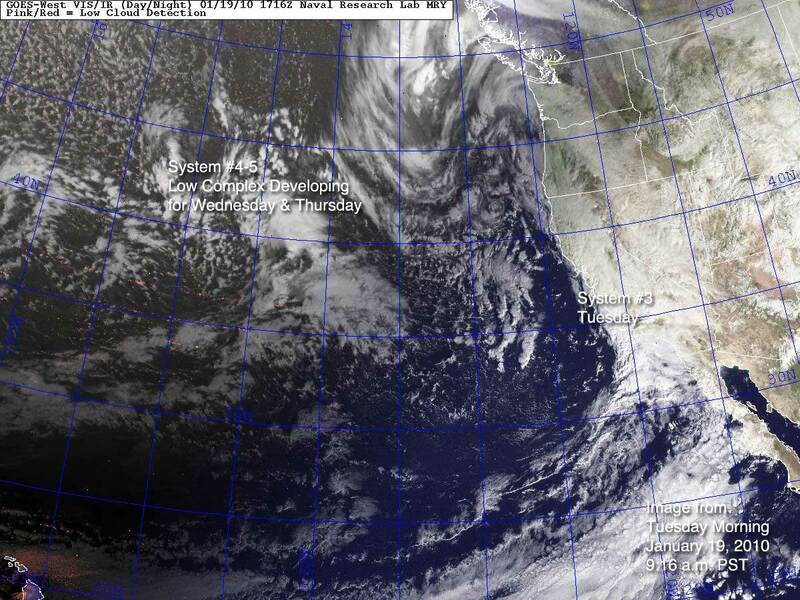 Unlike previous systems this week, Thursday's system is forecast to develop a surface low west of Pt. Conception. According to the WRF forecast a multi-centered surface low will develop and deepen into a 972 mb low west to northwest of Pt. Conception. In addition to the usual dynamics associated with such a low, a very strong jet is forecast to be in a position overhead that would maximize system dynamics. The formation of a surface low could also slow the progress of the system, potentially increasing precipitation totals. 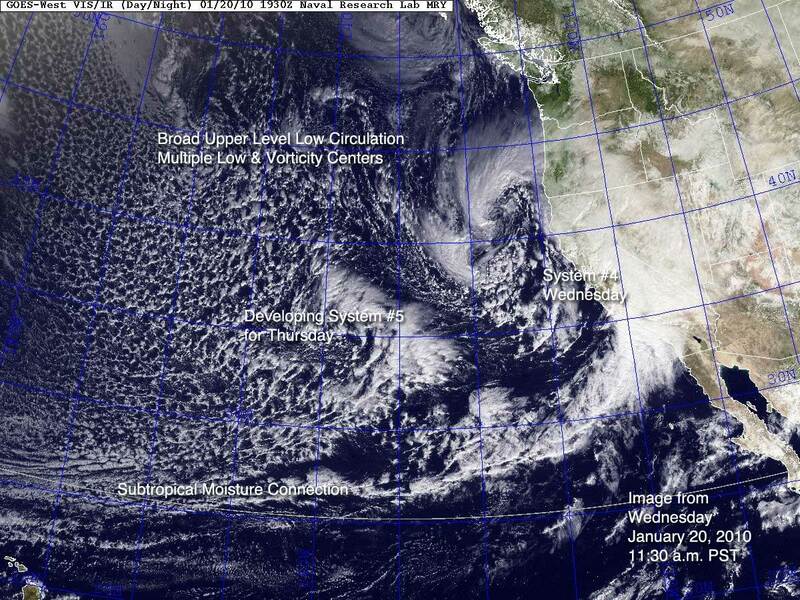 Too Many Southern California Storms to Count? 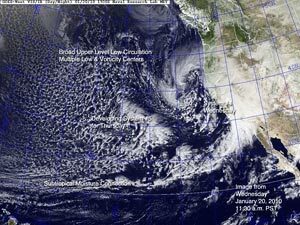 So many systems are moving through Southern California so fast, I thought I better check some satellite images and make sure I had my count right. 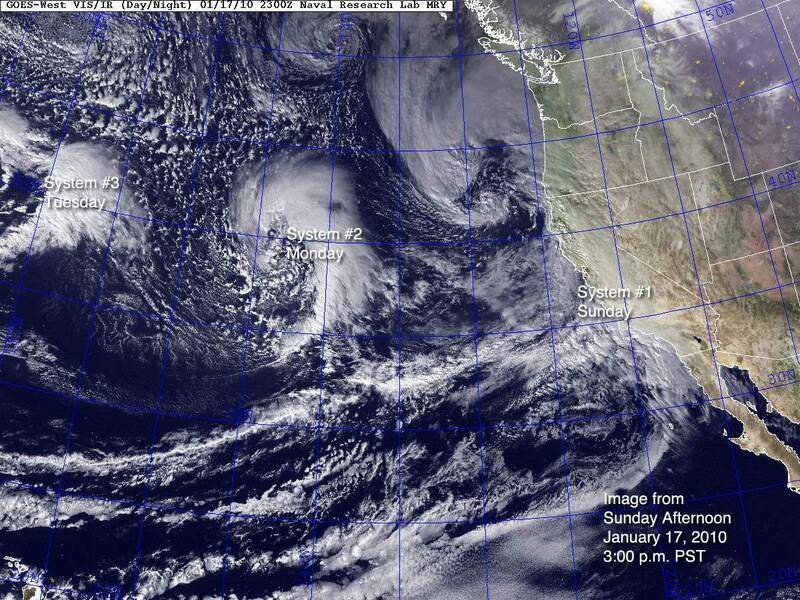 Here's a NRL GOES Day/Night image from Sunday afternoon that shows system #1 moving into Southern California, and systems #2 and #3 out in the Pacific. 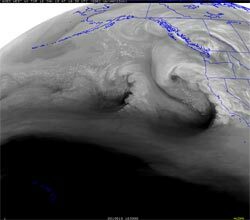 Then here is a NRL GOES Day/Night image from midday yesterday (Monday) that shows system #2 hammering Southern California. The combined rainfall totals from system #1 and system #2 are listed in this archived copy of NWS Public Information Statement issued this morning. Today's system is number three in the series that started Sunday afternoon. Intellicast.com composite radar shows the N-S aligned frontal band moving onshore this morning. Current QPF forecasts suggest precipitation amounts ranging from about 0.75 inch to 1.5 inches with higher amounts possible in the foothills and mountains, or in heavy downpours associated with thunderstorms. This system is colder and more convective than previous systems in the series, so precipitation amounts may vary widely. 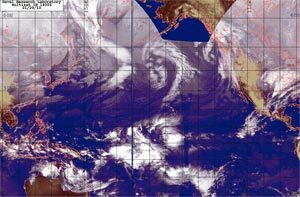 System #3 is a transitional system, as a large upper and lower level low complex and circulation develops in the Northeastern Pacific. The resulting system #4-5 looks to be the culminating event of the series, and is forecast to produce rain on Wednesday, and then again Thursday into Friday. BUFKIT analysis of 12z NAM data generates more than 3.5 inches of rain in the central San Fernando Valley from Wednesday morning through Friday afternoon. If the NAM forecast verifies, even higher totals could occur in orographically favored foothills and mountain locations. First Storm of Series in the Books. 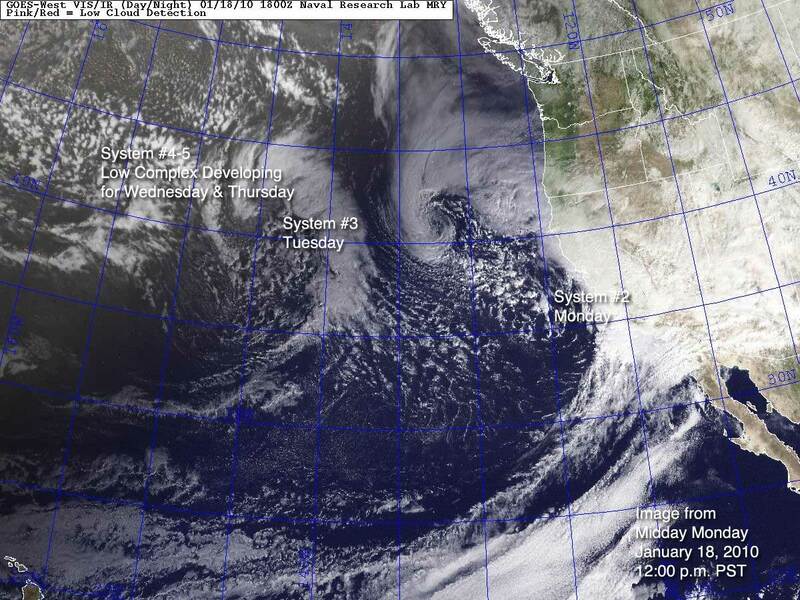 Second Storm Forecast to Slam Southland Today. The first of several systems forecast to affect Southern California this week moved through the area overnight, resulting in generally moderate rainfall. Precipitation amounts in the Los Angeles area generally ranged from about 0.3 inch to 1.0 inch, with somewhat higher totals in Ventura and Santa Barbara counties. Here's an archived copy of NWS Public Information Statement with preliminary rainfall totals through 4:00 a.m. this morning. All eyes now turn to the second system of the series, currently moving onshore. This system is expected to produce more rain, higher rain rates, stronger winds, and a higher likelihood of significant weather impacts than last night's system. Please refer to www.weather.gov/losangeles for the latest information. Showers Ending Today, Clearing Tonight. Shift to a Wet El Nino Like Pattern Expected Next Week. After nearly two weeks of idyllic days with temps in the 70's and 80's, it rained in Southern California last night and into this morning. But today's rain is just a precursor. Just a little reminder that it's the rainy season in Southern California, and more rain is on the way -- possibly a lot more rain. Skies will start to clear later today, and temps are forecast to be back into the 70's tomorrow. But the dry weather won't last. For several days forecast tools have been projecting a major pattern change -- to a wet pattern more like what might be expected in January of an El Nino year. Today's Climate Prediction Center 6-10 day precipitation outlook indicates a 70% probability that precipitation will be above normal in Southern California for the period January 19-23, and the 8-14 day precipitation outlook indicates a 60% probability that precipitation will be above normal for the period January 21-27. As part of its analysis, the CPC now uses historical analogs with 500 hPa patterns similar to the current forecast. In the 6-10 day forecast period the 10 most similar analogs produced above average precipitation in Southern California 9 out of 10 times. In the 8-14 day period the 10 closest analogs produced above average precipitation 6 or 7 times out of 10. Also of note, many of the analog cases with the most similar 500 hPa patterns are from wet El Nino years, such as 1958, 1978, 1983, 1992, 1995, and 1998. Late in the weekend, around Sunday evening, the first of these potentially strong systems is expected to move onshore. Additional impulses and systems are forecast to follow in quick succession, driven by a fast moving zonal flow and strong jet stream. 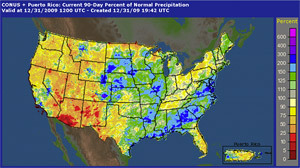 If current computer projections validate, the wet pattern could continue through the end of January. If precipitation totals approach what is forecast over the period, a host of rain related impacts are a possibility. We'll see. Update January 15, 2010. 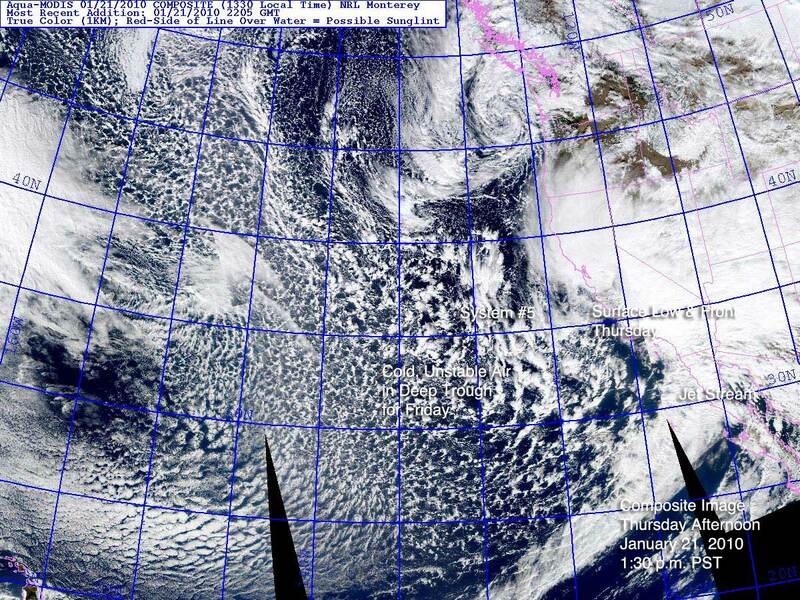 PDF of slides from NWS Los Angeles/Oxnard Weather Briefing "Significant Storm Impacts For Southern California Next Week" by Eric Boldt Warning Coordination Meteorologist. Presented on January 14, 2010. Please refer to www.weather.gov/losangeles for the latest information. Related post: How Does the El Nino of 2009-10 Compare to Other Warm ENSO Episodes Since 1950? How Does the El Nino of 2009-10 Compare to Other Warm ENSO Episodes Since 1950? Following is a chart comparing the 2009-10 El Niño to other warm ENSO episodes that have occurred since 1950. The warm episodes are based on the Oceanic Niño Index (ONI) and are those specified in the CPC's tabulation of Cold & Warm Episodes by Season. A description of the parameters follows the chart. 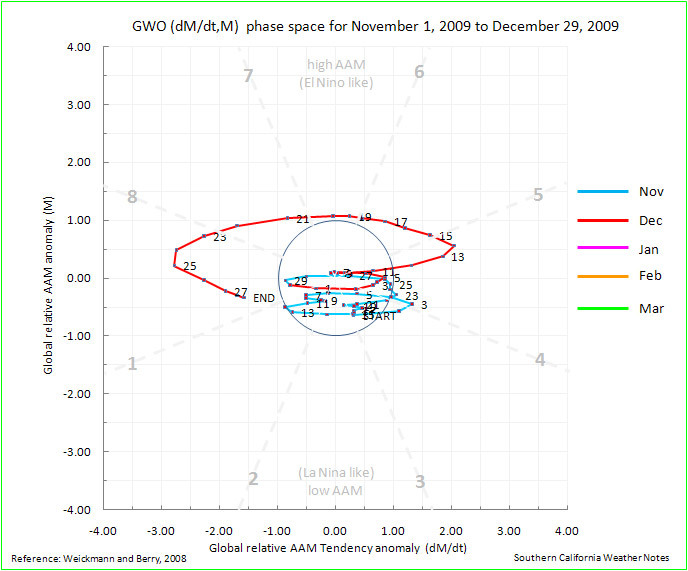 With the exception of 1951-52, a GWO phase space plot is included for each warm episode. Data for 2009-10 will be updated periodically. 2. AAM anomaly is average for Jan-Mar 1958. 3. Several MEI values were near 1.8 during 1972-73. 4. Continuous episode from JAS 1986 to JFM 1988. 5. Data as of June 30, 2010. Peak MEI: The peak seasonal value of the Multivariate ENSO Index (MEI). Reference Wolter and Timlin, 1993, 1998. Peak ONI: The peak Oceanic Niño Index (ONI) based on SST anomalies in the Niño 3.4 region. Reference Climate Prediction Center Cold & Warm Episodes by Season (1971-2000 climatology). In terms of typical El Nino impacts, Southern California is still waiting. If you squint your eyes and have a good imagination, there is a hint of an El Nino rainfall pattern on the West Coast, but rainfall over much of our area ranges from a little below normal to a little above. Including Wednesday's meager rainfall, Downtown Los Angeles is now about 1.1 inch above normal for the water year. That sounds great, but is a little deceptive. Some stations are well below normal and some well above. For example, Camarillo is 1.4 inches below normal, and Santa Barbara 2.3 inches above. According to the AHPS precipitation map, some mountain areas of Santa Barbara have had 200% of normal rainfall the past 90 days. 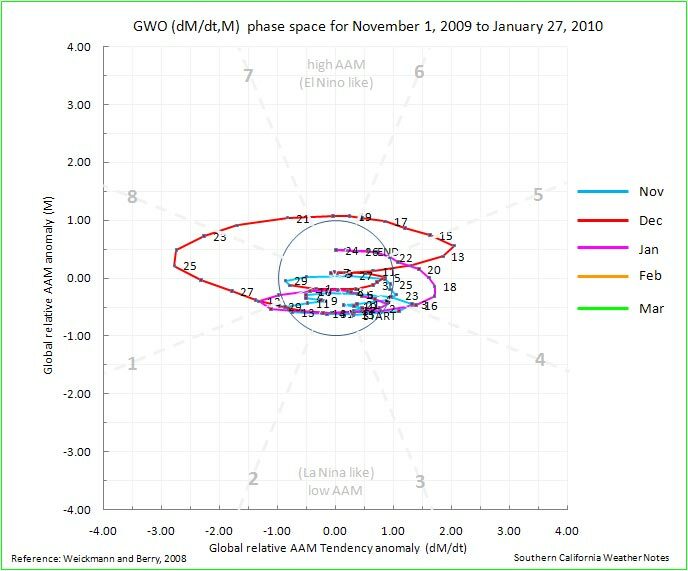 As expected, the Global Wind Oscillation (GWO) did orbit up into the positive AAM side of the phase space; but as feared, Indian Ocean/West Indonesian convection appears to have (once again) quashed the positive response. The average relative AAM anomaly for the period November 1 to December 29 remains slightly negative, and total global relative angular momentum is just about where it was at the beginning of November. Updated January 2, 2010. Recent runs of the GFS show the Pacific jet extending and then collapsing into another trough off the West Coast during the week. This seems a little late to be directly related to the recent GWO phase 8-1 transition. A continued orbit of the GWO to phase 2 and 3 would be expected to shift the jet north and could result in another highly amplified wicked ridge of the west. Today's 18z run of the GFS plows the trough into a resistant ridge with most of the energy going up and over the ridge. The 12z ECMWF splits the trough and attempts to bring part of it in under the ridge. We'll have to see how things develop during the week.